Welcome back to the Bake It! club and the first recipe of 2011. If you have joined in before then you will know all about the club and you are most welcome back. 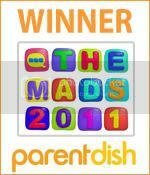 If you are new then a big hello and I hope you will join in when you see a recipe you fancy. For a quick explanation of what the Bake It! club is then please have a peek at this page. I don’t know about you, but I had plenty of sweet stuff over Christmas so I quite fancied baking something savoury this month. 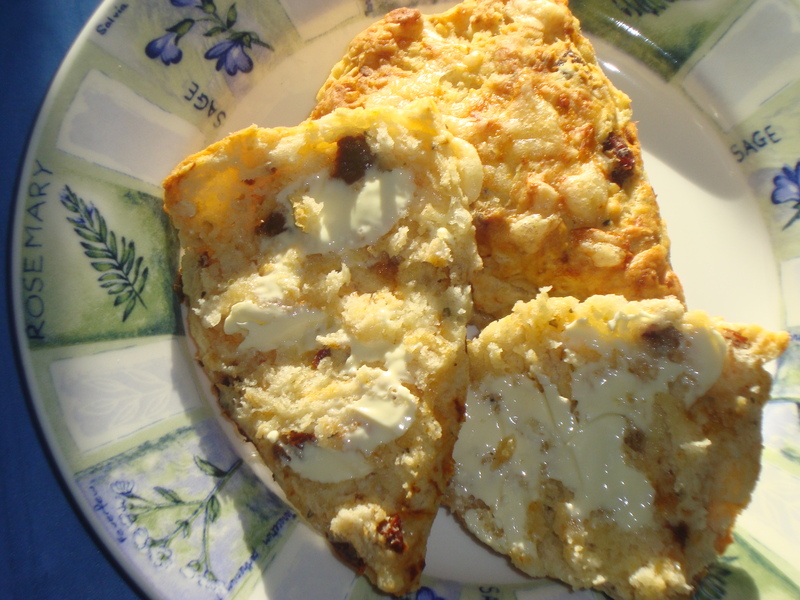 These scones are delicious warm from the oven, spread thickly with butter. If you haven’t got sundried tomatoes or fancy something a bit different, you can replace them with chopped olives or 2 teaspoons of wholegrain mustard. 1. 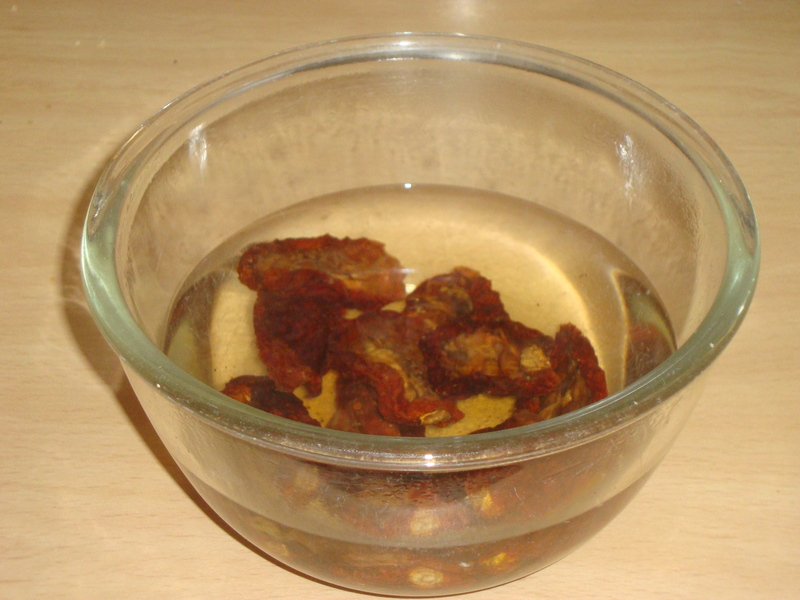 Soak the sundried tomatoes in boiling water for 30 minutes. 2. Preheat the oven to 180°C about 10-15 minutes before you want to bake the scones. 3. 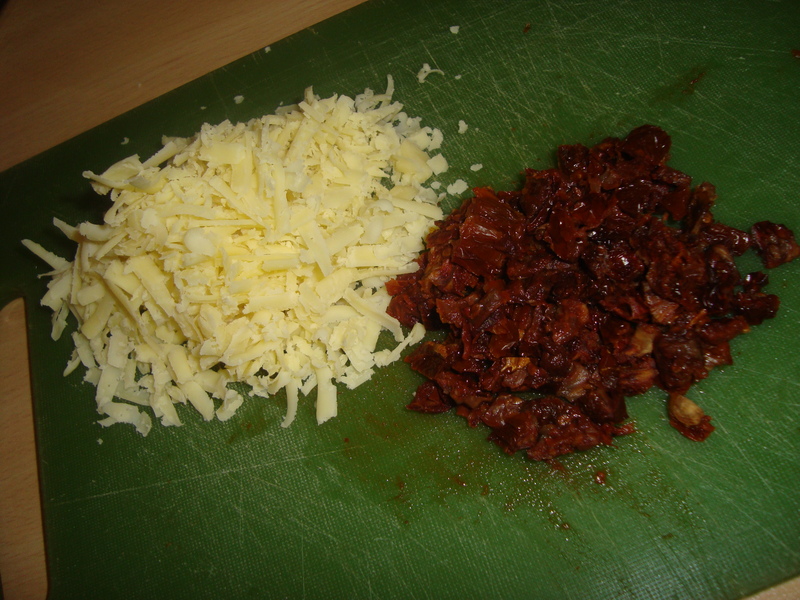 Drain the sundried tomatoes and roughly chop. 4. Grate the cheese. I always find it is best to use a good, mature cheddar – it means a little goes a long way and tastes good too. 5. 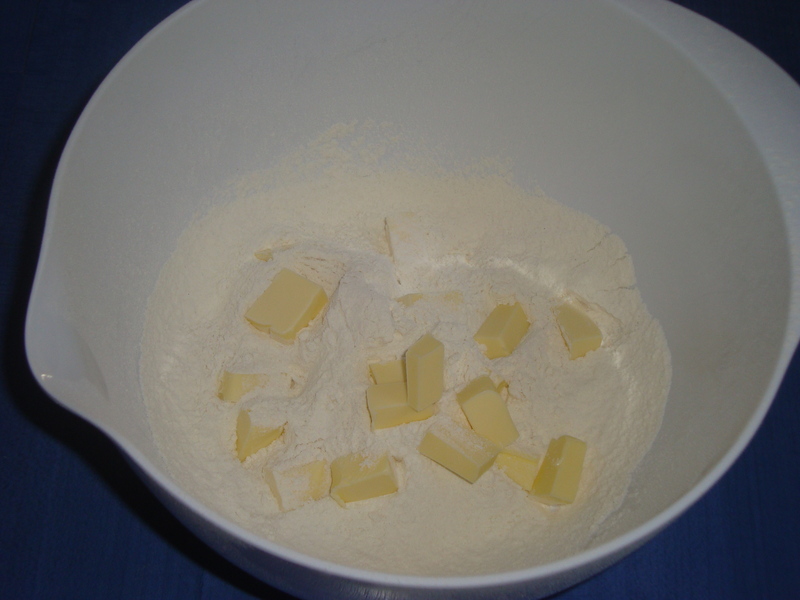 Sieve the flour and baking powder into a large bowl and add the butter. I find it is easiest to dice the butter before adding it to the flour. Then combine the butter and flour using your fingertips, a pastry blender or a couple of knives until it resembles fine breadcrumbs. 6. Add the sundried tomatoes, dried mixed herbs and cheese, reserving a small amount to sprinkle on the top, to the flour mix and stir to combine. 7. Gradually add the milk, stirring with a round-bladed knife until the mixture comes together to form a soft, but not sticky, dough. You may not need all the milk or you may need a little more – they key is to add it gradually. 8. Turn the dough out onto a floured surface and make into a ball. Flatten it with your hands until it makes a circle about 7 inches (18cm) in diameter. Cut the circle into 8 triangles. 9. 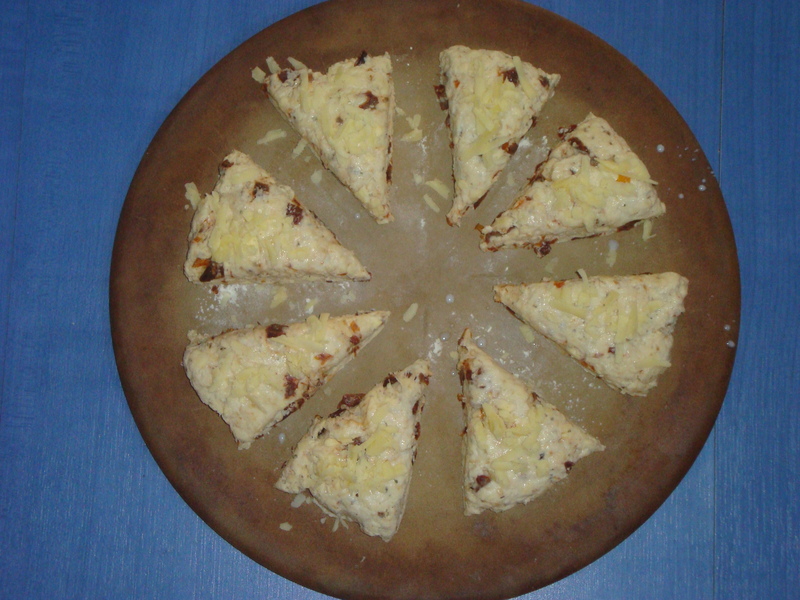 Sprinkle a baking tray with a little flour and place the scones onto it, leaving space between for them to rise. Brush the tops with a little milk and sprinkle over the remaining cheese. 10. Bake in the centre of the oven for about 15-18 minutes until the scones are golden and the bottoms seem cooked. If they don’t seem to be cooked after 18 minutes, check on them every 2 minutes until they look done. 11. Leave to cool for as long as you can bear before smothering with butter and scoffing! Scones are best eaten on the day they are baked or frozen for a later date. As always, if you’d like to grab a Bake It! blog badge from the side bar then please do. We also have a flickr group for you to add your yummy photos to and on Monday 24th January I will post a Linky for you to add your blog posts to. This will close on Monday 31st January at 8pm, when I will pick one baker at random to receive a copy of Weekend Baking by Sarah Randell. This month the Bake It! club is sposored by me and my own business Cake Shop Corner – please hop across to my new website and let me know what you think. If you know anyone who might be interested in offering a small prize for the club one month, please ask them to drop me a line. These look so good! Scones are delicious. They look so scrummy. First day of my diet though 🙁 Could make them for lunchboxes I suppose but not sure I trust myself not to devour them straight from the oven! Mmmm these look lovely! I’d gone into baking hibernation after all the sweet stuff over Christmas, but these are looking likely to tempt me out! I’ve not made much savoury stuff before so it’s a good opportunity to try something new. Your website looks brilliant by the way – you’re so talented! Just wish I lived nearer as I would definitely be on the list for the classes! I happen to have a load of sundried tomatoes knocking about so I’m quite tempted by this. Not had cheese scones for months.